My sweet little Harper Olivia has a severe case of plagiocephaly, otherwise known as flat head. Her head isn’t flat though, just SUPER asymmetrical. She will wear a doc band for 23 hrs a day, for about 4 months. Boo! 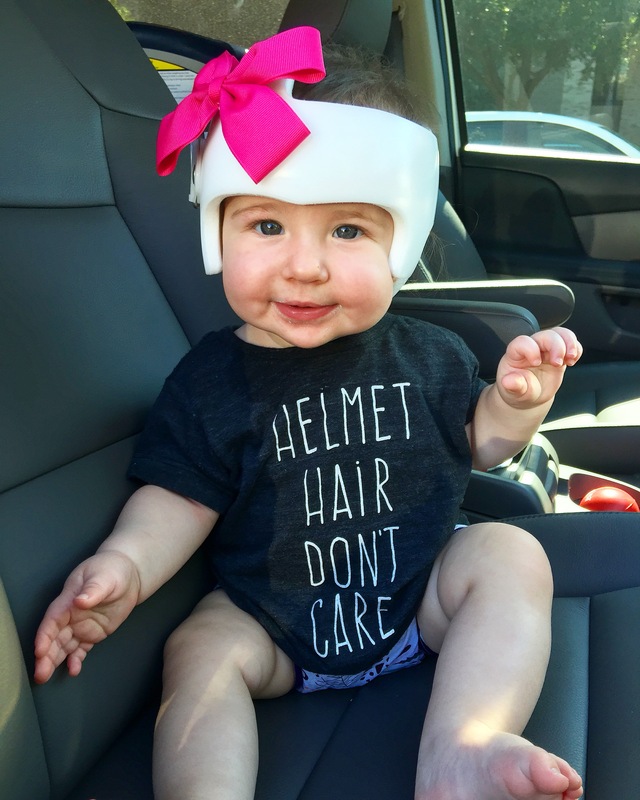 She doesn’t seem to mind though and as you can see, she rocks that helmet! We will get it vinyl wrapped soon, stay tuned! So it’s not just a flat spot ? Owen had a severe flat spot on the back but doctors weren’t concerned. It’s rounded out a lot since he started sitting! Fynnlee’s head is just flat but it’s also widened so fitting a standard sized bike helmet or whatever won’t happen if she doesn’t get it fixed. Greyson’s head is super wonky (that’s a technical term). It’s crazy flat on the left side and his ears are crooked. Poor little guy. Fynn should only have to wear her’s for 3 months and Greyson for 7 (yikes!). They will thank us later! Good luck Harper…can’t wait to see the bling!